As I'm mentioned before, maps are something I truly love. I have spent hours looking over a maps, letting my imagination vicariously explore the worlds they depict. I would explore the large hard-cover Rand McNally world atlas I received as a child, and the map inserts that came periodically with issues of the National Geographic, and visitor maps I collected on the way out of a theme parks (to keep in mint condition). I think maps are one of the most important innovations in human history. And like many creative mediums, maps can offer a lot of unique story telling qualities. The little details in a map are what can give it character. Maps can aid the creative process, giving depth and form for stories to unfold. J.R.R. Tolkien made maps of Middle Earth as he dreamed up the hobbit's adventures. I recently purchased a book of many of his illustrations, including detailed maps he used to create the Middle Earth landscape. Some of my favorite projects have involved making maps, like this map of Purcell Park, or this map of Uptown Charlotte, or this map of the block where I used to live. When I was younger I would often spend time creating detailed maps of places I'd been, or imaginary worlds. The first link I have to include is Charlotte's very own Map Shop. The Map Shop is a Charlotte-based map store that I first discovered many years ago, before I'd ever considered living in Charlotte. It's business is mostly online, and it' website is you might say, fairly antique, but it has a really impressive selection of maps available for purchase. If you're lucky enough to live in Charlotte, and are a map-enthusiast, you owe yourself a trip to the Map Shop. It's practically a museum of maps. If you're planning a trip abroad, you should check out their selection of foreign maps and travel guides. Of my collection of maps, the one that has meant the most to me, has been the map of Midtown Manhattan that I received when I was very young. 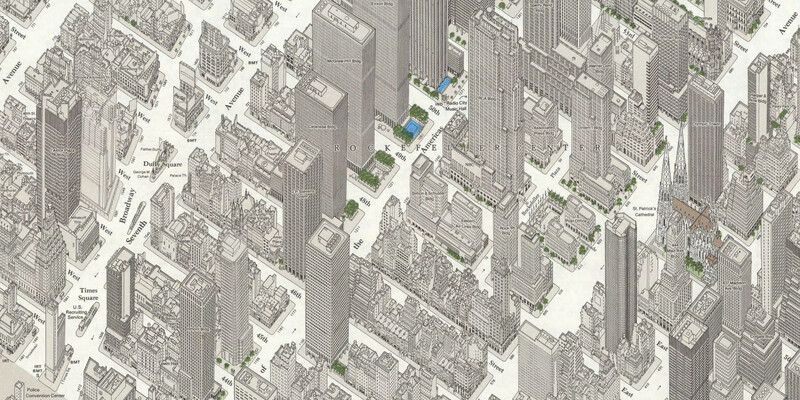 The isometric map contains unbelievable detail, right down to the phone booths and subway entrances. It went out of print in the mid 80s, but I recently found an online archive where you can download a very high rez copy. This was a very happy discovery after years of searching for other copies of this georgious map. Fans of Game of Thrones, a sprawling epic story set in fictional Westeros, rivals Middle Earth in complexity. It can be difficult to keep up with the multiple storylines, but thankfully fans have created a map that helps to keep up with the different story arcs. If you enjoy retro video games then you'll probably enjoy exploring the 8-bit version of New York City found here. It functions just like Googlge Maps, allowing you to zoom in with added detail. Other major cities have been added. My friend Robert recently emailed me a link to a GPS Artist's creations. By riding his bike around cities with a GPS tracker, he creates lines that produce an image. It's an unusual but very cool hobby that must take a lot of dedication. There is a map-like quality to the isometric creations of the German pixel artist trio known as eBoy. Their art recreates actual cities with retro video-game-inspired isometric illustrations, that are actually the result of hundreds of individually crafted images. Several large brands have called upon these unique artists. I ordered the NYC poster years ago. I've always had a special place in my heart for theme park maps. When I was younger I would examine the maps of theme parks for hours. I had quite a collection. It was a way for me to relive the experience of being there. This site contains lots of retro themepark maps, including several of my favorite park, Bush Garden's Williamsburg. Here is a unique theme park map for a park that does not even exist. It's a map of an imagined park based on the works of Japanese animation master Hayao Miyazaki. Check out the artist's Facebook page for more info, or read more about the map at Slashfilm. Imagine if Frank Lloyd Wright had created a map of Chicago. That's exactly what inspired Max Roberts when he created his map of Chicago. Robert's work includes many cities around the world, using various techniques.